Waldo's Blog - Microsoft Dynamics NAV NAVTechdays 2012 - another one you shouldn't miss! NAVTechdays 2012 - another one you shouldn't miss! Oh yes oh yes oh yes .. :-). That was my reaction when Luc Van Dyck told me he was going to organize a new edition of NAVTechDays - only one year after the last one. And you know how I liked it. If not, read this blogpost :-). To recapitulate: NAVTechDays was one of the most professional conferences I ever attended (and I have attended A LOT of them..) - knowing it was only organized by Luc Van Dyck - who happens to be a Belgian too (coincidence? :-)). Perfect accommodation, great seats, long in-depth sessions, no sales&marketing-fluff, … . What more do you want for your consultants? What more do you want as a speaker? What more do you want as an exhibitioner? … Nice looking women? Well, Luc promised to look into it .. I bet he will ;-). But sessions is not the only reason why you should attend. Not at all, actually. The conference provides the excellent opportunities to network, meet people, share experiences, gain ideas, … . You have to see it to believe it. In my opinion, spending two days on a conference like this, is worth a lot! First NAV conference with its own Windows Phone App! 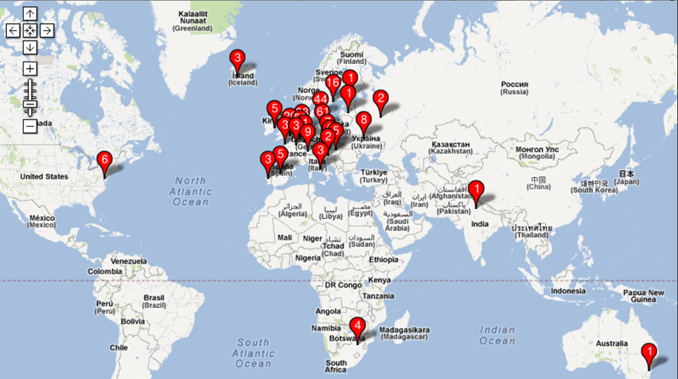 At this moment, there are 383 registered attendees, coming from 29 different countries. Among them, there will be 13 MVP's (3 more than last year), 21 Microsoft-people (you have a question?.. ), 27 speakers,… . Wow..
And yes, there are some special ones as well. Besides the fact that Luc is going to be there as well (and in my opinion, he's the most special one (no, I'm not getting paid for this..)) - Dan Brown is going to do the key note. And no, I'm not talking about the Author of the Da Vinci Code, but I'm talking about the head of Dynamics NAV people at Microsoft (obviously not his official title.. In fact, I was looking for his official title, and found about 5 of them online :-/ Let's just say he's head of Dynamics NAV R&D). Dan already posted this message on the Mibuso Forum (which says he's a General Manager of Dynamics NAV). Furthermore, there will be Alex Riley, which some of you might know (I must admit .. I didn't). If not, this might help: http://www.bbc.co.uk/programmes/b011cr8h. There is even going to be someone from Australia and South Africa. How cool is that? =-). Well, if they feel it's worth coming over to little Belgium .. you should too! See you all at NAVTechDays!